Good Monday morning, friends! I’m excited to share an exciting opportunity with Ingham County folks. 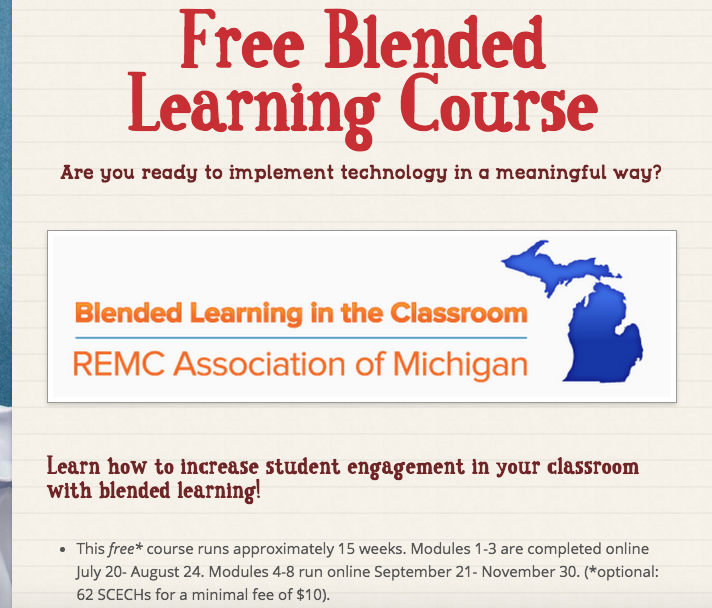 This Blended Learning Course, offered through the REMC and Ingham ISD, is an awesome opportunity to learn more about how to blend in your classroom/district. Through this course you will learn a lot of great things, like the variety of theories and approaches to blended learning, many Web 2.0 tools to increase student engagement, Universal Design for Learning possibilities, Copyright issues, and much more! The course is FREE! There is an option to receive 62 (woah!) SCECHs for a minimal fee of only $10. Either option is a bargain! To learn more or to sign up, visit this link – Blended Learning Course.